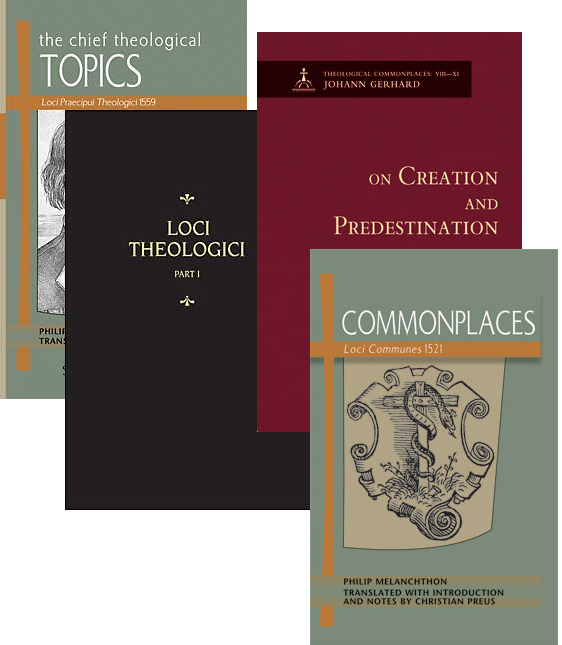 Why are so many great Lutheran books called “Commonplaces” or “Loci”? If anybody wishes to become a theologian, he has a great advantage, first of all, in having the Bible. This is now so clear that he can read it without any trouble. Afterward he should read Philip’s Loci Communes. This he should read diligently and well, until he has its contents fixed in his head. If he has these two he is a theologian, and neither the devil nor a heretic can shake him. The whole of theology is open to him, and afterward he can read whatever he wishes for edification. … There’s no book under the sun in which the whole of theology is so compactly presented as in the Loci Communes. If you read all the fathers and sententiaries you have nothing. No better book has been written after the Holy Scriptures than Philip’s. He expresses himself more concisely than I do when he argues and instructs. I’m garrulous and more rhetorical. But why that name, “Commonplaces”? Nowadays, something “commonplace” is common, and not particularly interesting—just the opposite of these classic Lutheran books of theology. “Commonplace” used to mean “common topic.” Commonplace-books were large blank books, divided by students into sections for taking notes. Each section had a topic. A book of these topics was a book of “commonplaces.” In the era before computers, this was an effective way to take notes and organize large amounts of information. According to an analogy drawn from Seneca’s Epistulae morales, no. 84, readers are to imitate bees, taking quotations from authors and writing them down for future use. While the origin of commonplace books can be traced to the classical Latin authors, they continued to be used until the Baroque era. The commonplace-books of the sixteenth and seventeenth centuries had their forerunners in medieval florilegia (collections of beautiful sayings) and preaching manuals. David Chytraeus, another sixteenth-century Lutheran and a contributor to the Formula of Concord, set forth his study program and instructions for constructing commonplace-books in his Praecepta rhetoricae inventionis (1562), De ratione discendi et ordine studiorum in singulis artibus recte instituendis (1564), and De ratione (1564). When reading, one should pay attention to what locus the author is currently discussing, one should notice statements and gather them like flowers, and one should observe good diction. All of these are things that can and should be excerpted and entered into one’s own commonplace-books. According to him, commonplace-heads are not merely a cataloging system, but should aid in generating arguments, ornamentation, and amplification. When using syllogisms in argumentation, one’s commonplaces can supply the major premises. For Chytraeus, the order of headings in a commonplace-book should be as follows: God, Ten Commandments, man, topics related to man (politics, moral philosophy, the artes), each of these topics being subdivided. Thus “commonplaces” are not commonplace, but a useful means to organize one’s study and to record key information and insights from other authors. Lutherans in bygone centuries used this method for taking notes, organizing information, and writing. By doing so, they prepared for themselves and for us an immense treasury of ideas and words, suited for every situation. WA 18:601.4–6 (cf. AE 33:16). AE 54:439–440, Table Talk no. 5511. Ann Moss, Printed Commonplace-Books and the Structuring of Renaissance Thought (Oxford: Clarendon Press, 1996).